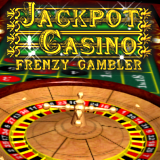 Become a lucky gambler in the Jackpot Casino : roulette; blackjack; superslots and puzzleslots. Wonderful graphics, 3D effects (e.g. roulette spinning), animations and multichannel sound turn the game into a pocket Las Vegas casino. Never too late to learn! In-game help and online tutorial are provided. The game supports 240x240 Windows Mobile devices (Treo 700w, iPAQ 6510, iPAQ 6515 etc). Versions for other platforms are also available.